Bev (aka Beestamper) challenged my Doubledog Dare Challenge group last week to make a card using this sketch design. You can check the link out on Splitcoaststampers (SCS) here (post #33) if you'd like to play along. Just be sure to put DDC in your keywords so we can see your creations. A couple of weeks ago, Lynn, who is the technique challenge hostess on SCS, had a really cool technique challenge that I wasn't able to participate in at the time and that was to make your own layer buttons. They are so easy to make and I love how they turn out!!! It's just a matter of having the patience to let the crystal effects dry. I used the same designer paper as the bottom layer on my card for my button. 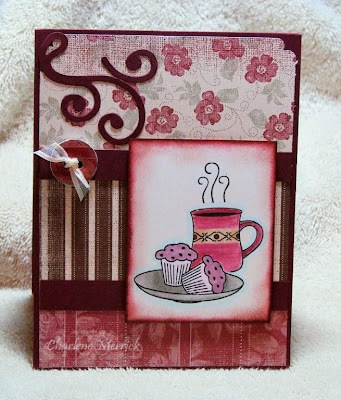 This is a great stamp set called My Cuppa Joe designed by Rupe Shevde and distributed by Gina K. Designs. I'm a huge coffee addict and have several friends who enjoy it as well, so this was a set that definitely belongs in my arsenal of stampin' supplies. I stamped the plate of cupcakes first, masked them, and then stamped the coffee mug. The cupcakes and platter were colored with Copic markers, as was the decorated tan section on the coffee mug. I didn't have a Copic marker that closely resembled the Bravo Burgundy, so I used a reinker and blender pen to color that. For my next card, I made it yesterday in honor of the featured stamper, Clownmom (Lois), on Splitcoaststampers and well as for the technique challenge to use the faux suede technique on SCS. This is a beautiful stamp set called Fruitful Harvest designed by Asela Hopkins and also distributed by Gina K. Designs. My leaves and the bottom olive panel are of the faux suede technique. The leaves were made by using Stampin Up's Christmas ornament punch. I drew veins on the leaves with my Old Olive marker and folded them in half. I heat embossed the sunflower image in black and then colored with Copic markers in a summer sun color. I applied touches of glitter to the sunflower by mixing a little tacky glue with water and applying dabs of glue to my image with a small brush and adhering the glitter. You have to work in small sections, though, as the glue dries quickly. If you're wondering about the chocolate in my post title, that would be for the m&ms I devoured while stamping. Snugs, snorts, chortles, and giggles....have a great day and thanks for stopping by. I always appreciate your visits and comments! oh sure! you just had to snarf up those muffins by yourself! don't share!!! boo hoo. these are both awesome! that flower is stunning. i will be hosting a sketch challenge over at the stamping boutique at snr every thurs. in our forum. tho' you have to use an SB image and earn 3 gold stars before you actually get a prize, it would be fun to see you there. my first challenge is up under Stef's challenges. think about it. Wow Charlene, they're bot GORGEOUS! Love the colors you chose, and that flower is amazing! Totally cute!! Love them both!! Wow Charlene!! These are both gorgeous!! 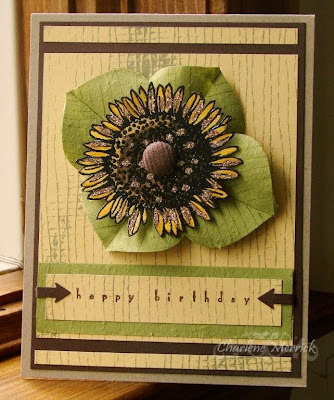 I lvoe the layout and colors on the coffee card and that glittered sunflower is stunning!! It really pops off the card at you. I have blog candy for my birthday on my blog if you are interested. Hi Charlene! I am one of your friends that is a coffee addict too...love your card with my fav designer paper and the cute button...looks good enough to drink!! Since I started this ladies' study at my house I have a huge bag of m&m's so it's bad news for me. My butts growing as I type!! hee.. Your sunflower is AWESOME... Gorgeous leaves and I like the center brad you used. Oh my goodness! These are wonderful!